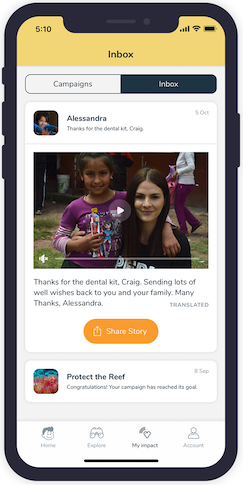 We love the idea of being able to give to charity and actually see where the money is going… but this should not be exclusive to the rich and famous or crypto and blockchain enthusiasts. We are not all fortunate to have millions of dollars in the bank and after all does your mother know what an ETH is or how to install MyEtherWallet and transfer tokens using Gas limits? The Little Phil team understands that as altruistic as it seems to think that everyone will go out of their way to buy crypto and use it to donate because it is better for transparency and decentralisation , this is not realistic. Thats why we are designing an end to end blockchain based giving solution that focuses on educating and simplifying the giving process for FIAT donors who currently make up over 99% of the total giving market. We have spent extensive time and resources researching and developing our solutions and are super excited to present our concept for a token incentive system that aids in the transparency, increased efficiency and adoption of blockchain based giving with a positive user experience — after all the older generations that make up the bulk of giving are not going to be around for ever, and nobody has developed a solution that caters for the next generation… until now with Little Phil. User generated content (such as receiver profiles and feedback confirmations) is essential and will need to meet quality standards on the platform to promote the giving experience that will be unique to Little Phil. To encourage these standards, an internal token based economic system will be created that rewards content creators based on the reactions obtained from donors. For example; when a receiver sends an expression of gratitude to the giver, a photo with the donated goods provides a better connection than a text message saying “Thank you” on its own, so it would receive a greater amount of reward tokens. Donors will also be able to upvote content whether they donate to that receiver or not, upvotes reward the content creator with an amount of LPC after reaching certain milestones. This tokenised incentive system also opens up the possibility of P2P giving by rewarding receivers for completing various tasks that assist in building up their trustprofile. Initially the validation of some of these tasks will need to be centralised for privacy reasons (e.g. submission of government ID), however there will be processes that can be democratised to gain the consensus of the broader community. The completion of each of these tasks will add to their trust scores which will be a key factor in whether someone decides to give directly to them or not. The Little Phil platform will use LPC as rewards and incentives for all stakeholders (donors, volunteers, and charities). As part of the gamification aspect of Little Phil, users will be awarded badges that can be unlocked by completing certain achievements. Each badge will come with an associated amount of LPC. 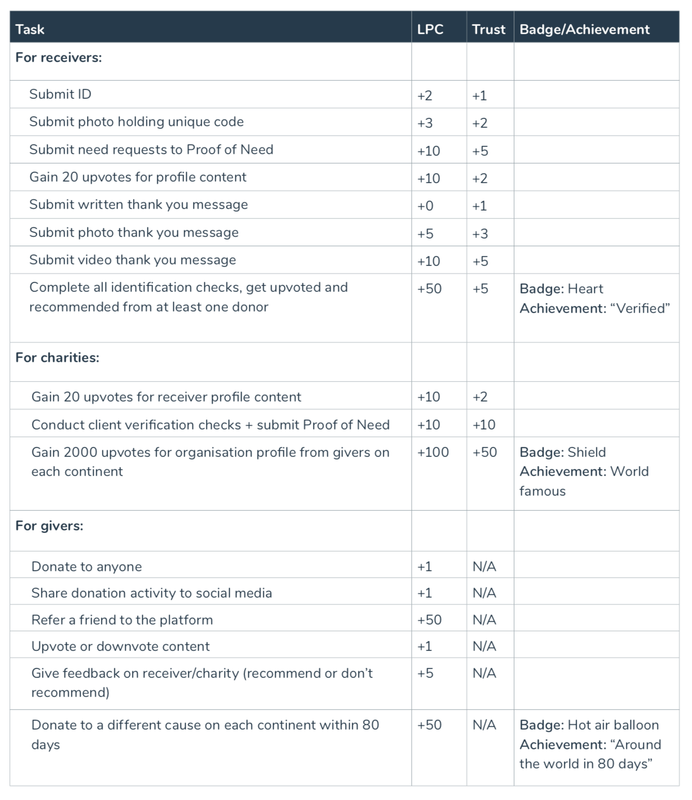 This will help build an engaging experience and keep the cost of donor acquisition low. Below is an illustration of how the incentive system might look for different stakeholders — values and tasks are indicative only. Example of trust and verification system using tokens. How will LPC be used as an incentive? Donors: will receive LPC every time they donate, share content or help introduce new donors to the Little Phil platform. This is a low cost way of generating awareness and adoption of the platform that also fosters a thriving community. Example: Anna likes to donate once a fortnight. She shares updates on the receivers/causes she has helped on her social media which prompts 2 of her friends to download the app and have a turn at helping someone. Anna receives reward tokens for each action and soon finds she has enough to double her next donation. Volunteers: Local communities need to be able to organise ad hoc events specific to their area. Individual givers on the Little Phil platform will be able to pool their LPC together to incentivise others to give some of their time to their cause. This pooled LPC can be traded for task achievements or it can be donated through to a specific cause. Example: A park in the local neighbourhood of Southport is covered in rubbish and litter and William decides to set up a campaign to get something done about it. He proposes a project on Little Phil and sets a goal of 500 LPC to give as an incentive to clean up the park. William shares it with his friends in the area who all chip in a small amount of LPC and the goal is achieved. James is unemployed and looking for a way to pay his bills, he receives a notification that there is a community project looking to pay 500 LPC for assistance. He promptly accepts the volunteer project, cleans the park up and submits a picture to confirm. William and the contributors confirm that the park is looking great and release the LPC to James. Charity Administrators/ Beneficiaries: Charities on the Little Phil platform will be able to earn LPC when they provide confirmations, updates and content back to the donors and campaigns. The level of reward is attributed to the quality and type of engagement the charities provide back to the Little Phil platform. Example: Sally has just used the Little Phil platform to purchase school books for Jose. Jose has been notified that the school books are on the way by the charity that assists him and he is extremely grateful and excited. The charity sends a confirmation that Jose has been notified and 0.5 LPC is earned. The supplier of the school books has delivered the school books to Jose, and the charity decides to upload a small video of Jose and his parents saying thank-you to the Little Phil platform, this is considered the highest value content and they are rewarded with 5 LPC. 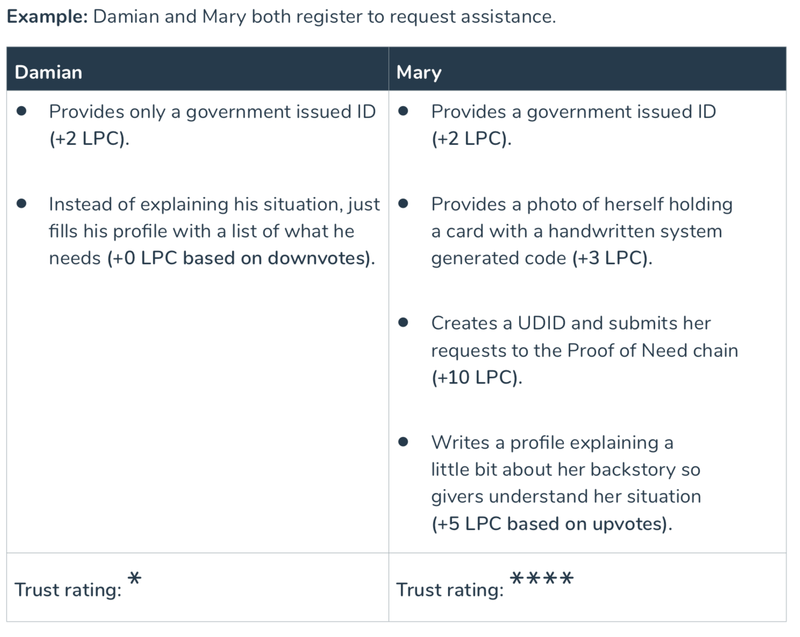 In the above comparison, Mary’s profile would be listed on the platform with a highertrust rating than Damian, along with some reward tokens for putting the extra effort in. This process provides donors with more information when deciding on who they want to give directly to. All Figures of LPC are for demonstration only and are subject to change. Little Phil is a small team using blockchain technology to radically transform the giving experience. People can better connect emotionally with causes that resonate with them, see exactly where their money is going & ultimately experience and share the rewarding pleasure of giving. If you enjoyed the article please check us out on the following mediums and support our project! Check out our explainer video here! Our Pre-sale is now live! Get your LPC today and help us make a HUGE IMPACT! Do you love our project and want to see a change? Donate to our cause and help us show the world the amazing things blockchain can do! Little Phil — Now anyone can be a Philanthropist.